T-Take Him at His word. When we take Him at His word, we realize that God is not a human who changes his mind, but instead does what He speaks and can be trusted to do as He promises. 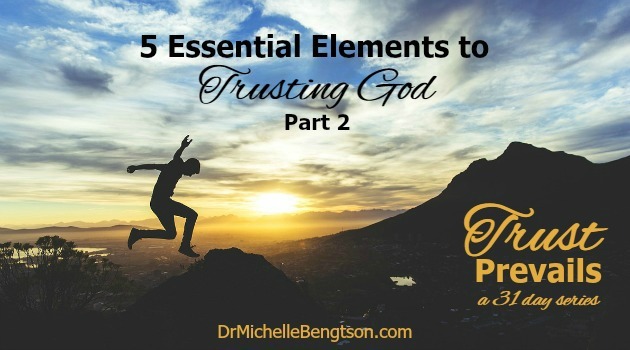 In seeking the Lord about how to more intentionally and deeply trust Him, the second essential element He highlighted to me was: R – Rest in His Presence. In trusting God, I acknowledge and rest in the knowledge that He is in control, rather than striving in my own strength. Trusting God takes the responsibility for the outcome off my shoulders and places it on God’s. That brings comfort because my vision in any situation is limited to what I know about the past and the present; God has a great advantage. He not only knows my past and present, but He also knows the past and present of all those whom I have ever or will ever interact with, and He knows our future. God knows all things past, present, and future. There is no limit to His knowledge, for God knows everything completely before it even happens. I can rest in His presence, knowing He longs to care for His children. How will you rest in His presence today? Hope Prevails is available now wherever books are sold. To find out more, see: Hope Prevails Book.